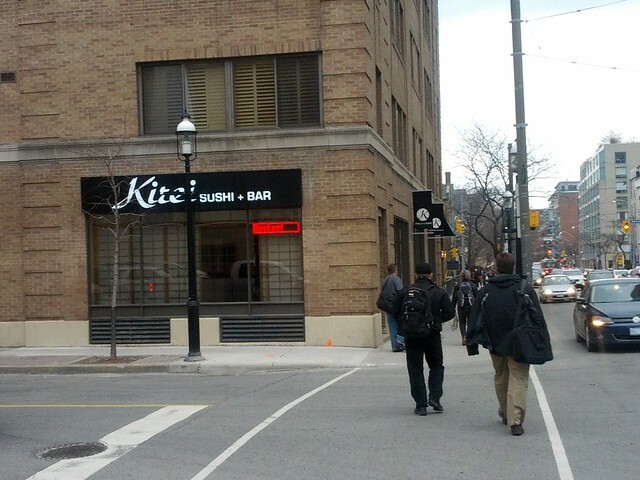 Located near the corner of Church and Adelaide in downtown Toronto, Kirei is a fairly big sushi restaurant that has been open for a few years now. The restaurant seating is a mix of booths, bar seats and some ‘zashiki’ style seating. Please read our conversational review, below. 7.0 / 10Decent enough place but avoid the Kirei Rolls like the plague. 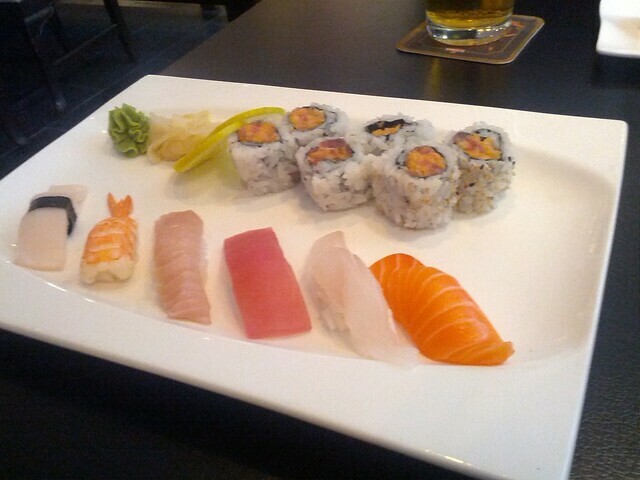 7.5 / 10I want a do-over — Nice spot, but too many weird roll combinations – Must. read. ingredients. carefully. I never even knew this place existed but from outside to inside, does look pretty nice. Was there a few minutes early and was seated right away as it wasn’t too busy. Guess it helps that we were meeting at 5:15pm! Briefly scanning the menu, I noticed they have the standard stuff but also a lot of different kind of crazy specialty rolls that you’ll probably never see anywhere else. There were rolls called “the Volcano” and believe it or not, “The Viagra”. Wo… I missed “The Viagra”! — but, yes, it was a fairly extensive menu – likely something for everyone (including those who are into trying weird roll combinations). Speaking of rolls, we have a bit of a tradition here at SushiToronto of ordering the roll named after the establishment. Thus, the Kirei Roll was selected, along with the sushi pizza, a spicy tuna roll, the Kamikaze Roll, and a sushi combo (nigiri assortment with a few rolls). Did you notice they all the waiters/waitresses (at least the two I saw) had white iphone style headphones on? Not sure if they actually use it to communicate with each other or just so they can be connected to their phones! See something new every day. 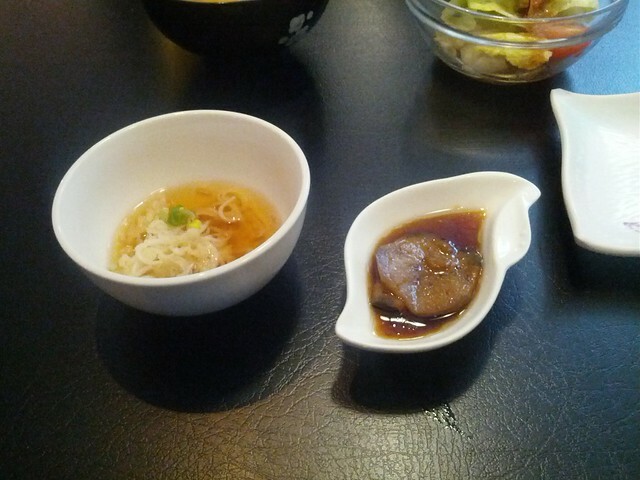 Any ways, before the dishes came out, we were served a few fee appetizers, some kind of small cold noodle soup and I think some eggplant with soy sauce type. Tasted okay but it’s free so I can’t complain too much. The eggplant was decent. The rest of the dishes weren’t too far behind that. I believe the first thing I reached for were the spicy tuna rolls. No complaints here. I wasn’t blown away but I’d get them again. All the dishes we ordered came out almost all at once. Agreed about the spicy tuna rolls. Tasted fine by me as well. Same can be said about the sushi pizza. Was decent but nothing spectacular. Making my way to the Sushi Combo plate I see we kind of screwed up as it also comes with some spicy tuna rolls too. Ah!… true. The nigiri was decent. I’d say better then a lot of places we’ve been to. 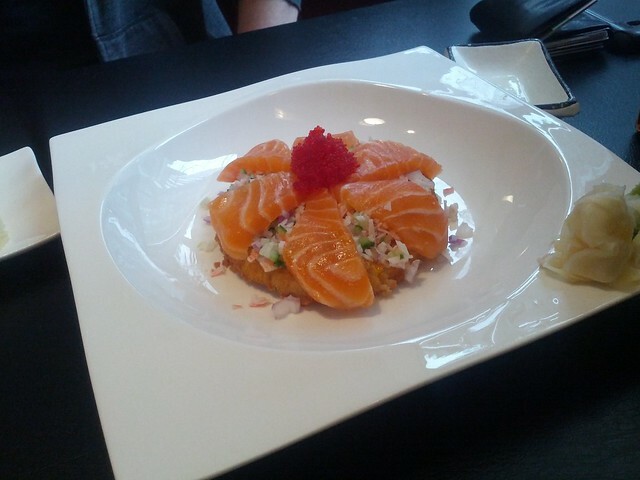 Oh, yeah, the sushi pizza: Seemed fairly like the norm. BUT, it’s the “specialty” rolls where Kirei seems to want to set themselves apart, it seems. As per custom, we ordered the roll named after the establishment – and this one, the “Kirei”, comes with an ‘interesting’ mix of ingredients: deep fried shrimp (ok, not bad), cream cheese (ummm), strawberry (what!? ), avocado, cucumber, bbq eel, tobiko, potato chips (say again? 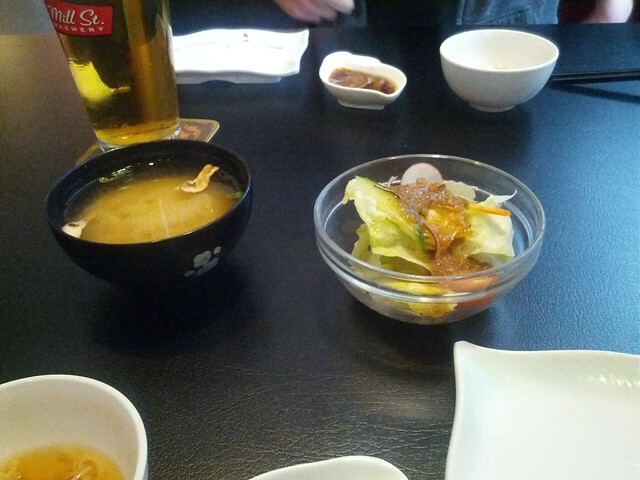 ), and sweet sauce. Let’s just say I felt like I was eating a dessert. Maybe make it the last roll of the night? Most of the food was decent enough. No real complaints other than the Kirei roll. It’s a big miss and big mess for me. Just too weird a combination that doesn’t work. The strawberry cream cheese works on a bagel but on a roll?? Nope. 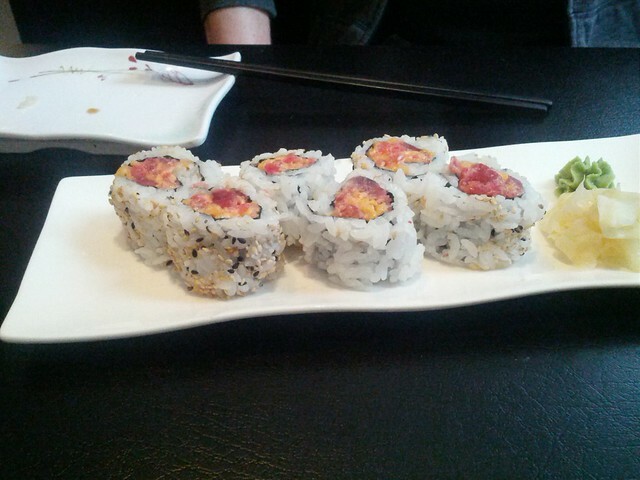 I even regret ordering it after seeing lots of other rolls to try that is probably way more appealing too. Oh well, we have to follow our Sushi Toronto rules and we can’t win them all. Overall a decent place for the area but I’d recommend going through a variety of their rolls to see which ones stand out. Of course reading the description probably helps too. 7 out of 10 for me. Heh… we skipped that detail. 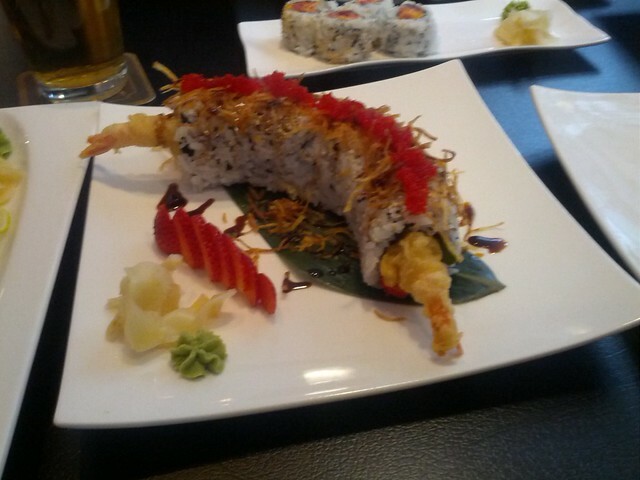 Yep, the Kirei roll was a bit of a disaster. Was a tough one to get through. I will give them marks for having rolls out of the norm, however. As you said, likely worth trying again – but with a bit more thought process put into what we order!? 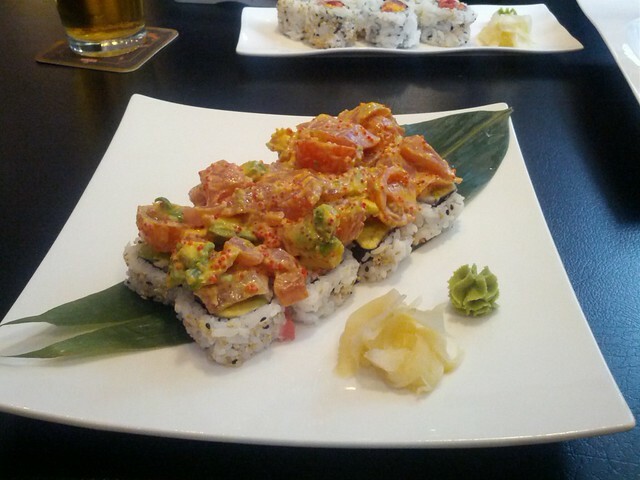 The other large roll we ordered was the Kamikaze – which was my quick ‘pick-something-because-the-waitress-is-here’ pick (tuna sashimi, diced tomatoes, avocado, tobiko, spicy sauce, on top of the lobster salad roll). I enjoyed this one, except for the diced tomatoes — seemed out of place. Overall, nice enough spot, with good service. Worth another round some day: 7.5/10.